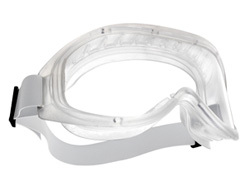 The Super Blast AutoClave is the worlds leading clean-room goggle and specially designed to withstand the temperatures within an autoclave without distorting. They use optical quality 1 lenses for long term and regular use in addition to being both B & T rated for protection again impacts at extreme temperatures. Since they must withstand high autoclave temperatures, the lenses are left 100% untreated. 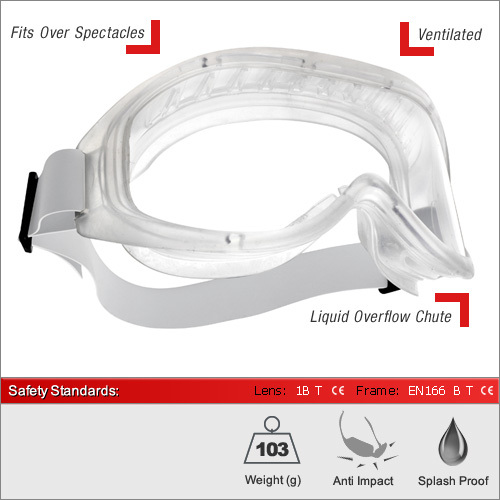 These goggles also come with the platinum coating meaning they are anti-scratch and anti-fogging lenses as well protection from large dust particles and liquids. The goggles can also be comfortabley worn with a half mask respirator. During seperate tests the lens retained it's original optical clarity and strength even after 30 full autoclave cycles. This is unmatched by other brands.